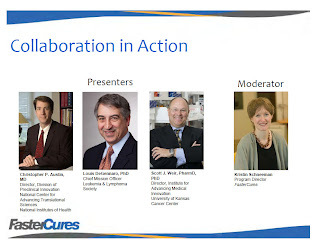 The Learning Collaborative, a partnership between the Leukemia & Lymphoma Society (LLS), University of Kansas Cancer Center, and the National Center for Advancing Translational Sciences (NCATS) at NIH, is attempting to break the traditional drug discovery and development paradigm by bringing together blood cancer, drug discovery, and development expertise across several organizations. The Collaborative was formed with the goal of targeting repurposed drugs as well as novel, new drugs for the treatment of rare blood cancers. Last week at a TRAIN (The Research Acceleration and Innovation Network) Webinar, the leaders of this unique effort shared what they’ve learned since they signed the Cooperative Research and Development Agreement (CRADA) in 2010. CRADA defined the resources and expertise each collaborator brought to the effort. The three partner organizations bring complementary strengths to this collaborative. LLS has ample experience working with industry partners, an established network of experts, about 400 active research projects to contribute, and the sense of urgency that patient-driven foundations uniquely bring to the table. The University of Kansas Cancer Center excels in “bench to bedside” translation in drug repurposing, leadership in chemistry, and pharmaceutical experience. NIH’s NCATS brings a focus on rare diseases, industrial scale capabilities, and pharmaceutical experience. “While some progress has been made in combating these cancers – half of the FDA-approved drugs of the last decade were approved for use in blood cancers – 50 percent of those newly diagnosed will die from their disease within five years,” said Louis DeGennaro, PhD, chief mission officer of the Leukemia & Lymphoma Society. Keeping the patient in mind will accelerate the process and ensure their needs are front and center in the research agenda. Defining the collaboration, setting collective objectives, and managing expectations are fundamental. Project management is critical, both to manage across organizations and to maximize appeal to industry. Tech transfer must be integrated into teams to optimize the leverage of the data. Regulatory science issues that will impact their chances of success need to be addressed in the course of the research. Defining exclusivity paths and reimbursement strategies from the earliest stages is central to the effort. The group is working on what they call a “ValueMaP” (Value Maximization Path) to help define the value proposition for drug repurposing. Currently, there are four active projects, two of them involving repurposing rheumatoid arthritis drugs for use in rare blood cancers (the other two are in earlier stages). The goal is to advance projects to clinical proof of concept within 14 months and to engage industry partners along the way.